(Directorate of Secondary Education Department). There are total 3080 vacancies available in this current recruitment of Jharkhand State Secondary education department PGT Teachers of Physics, Chemistry, Mathematics, English, Hindi, English, Economics, Geography, Biology, Sanskrit, History. 1540 PGT Teacher vacancies are going to fill through direct recruitment and another 1540 PGT Teacher vacancies reserved for 3 years experience having candidates. Eligible criteria having candidates can submit application form online for PGTTCE Exam 2017 @www.jssc.in on or before the last date of 10-Jan-2018. Selection for these vacancies only based on PGTTCE Exam marks only. For more details related to Jharkhand SSC PG Trained Teacher Jobs see the below provided information. 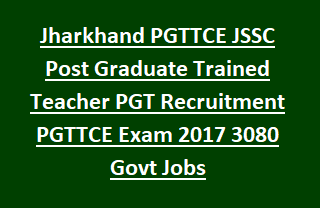 There are total 3080 PGT Teachers Jobs are going to be recruited by Jharkhand SSC through Post Graduate Trained Teachers Competitive Exam 2017. 1. Upper age limit for General candidates 40 years, for Female candidates of General/MBC/BC candidates is 43 years, Male candidates of BC/MBC is 42 years, For SC/ST candidates 45 years. Must have completed post graduate M.Sc/M.A/M.Tech (Physics/Chemistry/History) with at least 50% marks (For SC/ST 45%) from a recognized university and B.Ed in the relevant subject. Candidates have to pay Rs.500/- towards examination fee. For SC/ST candidates examination fee is Rs.125/-. Exam Fee to be paid through online @www.onlinesbi.com while selecting the option "State Bank Collect". Selection for these vacancies will be held based on written examination only. Eligible candidates can apply online @www.jssc.in on or before 10-01-2018. Provide valid educational details, Experience and communication details. Pay the examination fee online and submit the application form. Take a printout of Application copy and fee paid copy for future reference.